Yggdrasil introduces new real money blackjack games in 2019. Yggdrasil broke the digital gambling mold in mid-2018 with the release of its very first interactive table game. It was unlike anything the iGaming community had seen before; certainly not typical of the RNG-based table games released the last two decades by their competitor brands. It was, instead, a perfect meld of the more modern live dealer casino tables, featuring multi-player capabilities and a professional dealer, except that all of these features are visualized in HD-quality, 3D animation—even the not-quite-human, avatar of a dealer. That dealer’s name is Sonya (hence the game’s title, Sonya Blackjack), and she’s become quite the popular little lady. So popular that Yggdrasil has decided to expand upon that success by introducing a new Lucky Blackjack game—a similar concept but with an Irish theme—and enhance its original release with side bets. Lucky Blackjack is the newest game launched on Yggdrasil’s trademark REDUX gaming platform. Like Sonya Blackjack, it blends RNG and Live Dealer aspects. The game itself is RNG-based, while the dealer’s actions utilize motion-capture technology derived from the body language and gesticulations of a real life, professionally trained dealer. The new Lucky Blackjack game closely mimics its first-born sibling, Sonya Blackjack, in a number of ways. Most notably, it is capable of supporting multi-player access. The game supports up to 3 individual human players at once, proffering what Yggdrasil calls, “a truly interactive, shared casino experience”. Lucky Blackjack is an immersive new table game that abides by all the traditional rules of blackjack, with two thematic side bets available. These include the Lucky Lucky side bet, and the Lucky Ladies side bet; both honoring the game’s beautifully rendered dealer of the same name. This latest edition is endowed with swifter animations, speeding up the pace of the games. It also gives players the option to make ‘pre-decisions‘, such as choosing to Hit or Stand before it becomes their turn to act. This also helps to speed up game play. 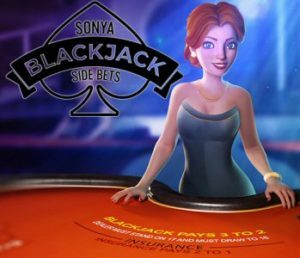 Fans of the Sonya Blackjack game will find these expedient features now available. The updated version includes both the swifter animations and pre-decision functions described above, and also comes with its own pair of optional side bets. They include Perfect Pairs and 21+3. The Perfect Pairs side bet pays out bonus winnings when a player is dealt a pair as their first two cards. The rank and suit of those cards will effect the size of the bonus payout. The 21+3 side bet plays out similar to a 3-card poker hand that is completely separate from the blackjack game. Players use their first two cards, plus the dealer’s up-card, to create a 3-card hand. If this hand ranks within the range of winning hands on the 21+3 pay table, the player wins the corresponding pay out. Honney goes on to praise the company’s new real money blackjack games for providing a superior level of “player engagement in the form of side bets,” ranking them among “the most engaging, immersive table titles on the market today”.